The amazing Jennifer Timko is our sketch hostess this week at Freshly Made Sketches. She has designed this fabulous sketch. 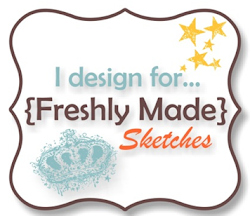 Come and join us at Freshly Made Sketches. While you’re checking out our challenge, take a look at the wonderful inspiration from the Design Team. Love the bauble you colour with your blendabilities with so much detail,the string sets the card of beautifully!!! So pretty! Love the big ornament! And the panel tied with twine looks like a package – cute! I love this ornament but I’m trying not to buy it as I’ve got miles of Christmas stamps! But you’re tempting me with this card – love these colours together. Beautiful card Narelle! That ornament is just lovely! Such a great job with the colouring! Love the colours! What a great Christmas card! Pretty! I love the bauble. Although we call them ornaments here! Pretty Christmas card,Narelle!! Beautiful ornament and i love the string!! great use of papers. I really like this sketch and it was so fun to put together…great for mass production. This is such a lovely Christmas card. I really like how you’ve colored it with a little bit of a ragged edge. Thanks for sharing your talent! It just keeps getting better, if that’s even possible! This card is perfection in every way. Love the details and combination of papers that just bring it all together. That ornament is so pretty and all your details are perfect, as always!